The recovery from breast cancer often involves reconstructive surgery that can impact muscles and movement elsewhere in the body. Cancer Exercise Specialist training provides you with the guidance to understand the different surgical procedures, their impacts and how to design safe and effective exercise programs that take into account the surgical impacts. Two common procedures for breast reconstruction are the abdominal TRAM procedure and the LAT FLAP procedure. Here we outline top exercises that can help the recovery with these two procedures. TRAM stands for transverse rectus abdominis myocutaneous. The rectus abdominis is a muscle in the lower abdomen between the waist and pubic bone. A flap of this skin, fat, and all or part of the underlying muscle are used to reconstruct the breast in a TRAM flap procedure. The LAT FLAP reconstruction uses the latissimus dorsi muscle to rebuild the breast. The latissimus dorsi muscle is located in your back, just below your shoulder and behind your armpit. One of the most important, if not THE most important part of recovery from the debilitating side-effects of breast cancer surgery and treatment is correcting postural deviations that are the result of muscle imbalances. We must re-educate the body to restore its’ normal balance. Most of us think of balance as one’s ability to stand without falling, but it actually represents the ability to stabilize and maintain a specific body position. Postural control is defined as the act of maintaining, achieving, or restoring a state of balance during any posture or activity. Therefore, it only makes sense that performing exercises to correct range of motion and postural deviations, while incorporating the aspect of balance, would yield the greatest results! Many women will have the option of immediate breast reconstruction, while others will wait a year (on average) to undergo reconstruction. This wreaks more havoc on the body as scar tissue and adhesions may already exist prior to re-opening the mastectomy site. While it may seem that implant reconstruction would be the easiest and most logical, not everyone is able to, or wants to, undergo that procedure. If the skin is damaged from radiation, it may not even be an option. Many women do not want anything artificial in their body, nor do they want to have to undergo additional surgery every ten years to replace their implants. Below we present you with our recommended exercises for the most common breast reconstruction procedures. Do not begin this exercise program without consulting your physician. These exercises are not intended for use by every breast cancer patient/survivor and if done improperly may result in injury or other side-effects. Lie in prone position with arms at sides (shoulders stacked over elbows). Contract glutes, engage abdominal muscles and gently push up (as pictured). Pause for 3-5 seconds. Repeat several times as tolerated. Repeat several times per day until posture is good and you are able to stand erect. Low back stretch – Lie supine with towel or pillow under neck to keep cervical spine in neutral (if necessary). Draw legs toward chest (can bring them toward the side if it’s more comfortable. Hold for 20-30 seconds. Repeat several times per day. Hip flexor stretch – Assume a “lunge” position with the left leg on the outside of a 65″ ball and the right leg behind. The left leg will push inward keeping ball against a wall. Stand tall, draw belly button toward spine, and slowly lower down while holding your left leg in position and gently pushing forward with your right thigh and simultaneously contracting right buttocks. Hold for 3-5 seconds. Maintain control and slowly go up to starting position. Repeat several times as tolerated. As you become stronger, you can hold the stretch for a longer period of time and/or perform more repetitions. 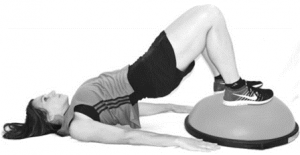 Bridge (begin on the floor, working up to BOSU(R) when strong and stable). Lie in supine position with arms at sides, knees bent, and stacked over ankles. If need be, place rolled-up towel or pillow under head to support neck. Contract glutes and push up through heels into bridge position. Continue to contract glutes and push both thighs gently towards center. Pause for 3-5 seconds. Repeat several times as tolerated. Perform this exercise 2-3 times a week with a day in between. 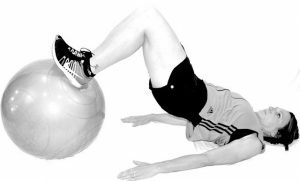 Ball plank with hamstring curl – Lie in supine position with heels positioned about 6″ apart on top of exercise ball. Arms should be wide at your side for a strong base of support. As you exhale, dig your heels into the ball and lift your hips off of the floor. Squeeze your gluteal muscles and engage your core. Hold for 3-5 seconds or as tolerated. Slowly lower back to start. If you can do this with no pain, try pulling the ball toward your buttocks, slowly returning it back to plank position, and then slowly lowering back to start. Repeat up to 12 times (as your body tolerates). Once completed, repeat exercise #2 to decompress the spine. Perform this exercise 2-3 times a week with a day in between. These exercises should not be done without proper supervision and prescription by a Cancer Exercise Specialists or Physical Therapist. Timing and sequence of exercises depends on each individual and their recovery rate. At any point during your exercise session, if you experience swelling in affected area or unusual pain or discomfort, stop exercising or modify your position. If it continues consult your doctor before resuming your exercise program. *Remember that the rectus abdominis, if fired, will contract under the breast where it is now located. Head/shoulder blade retraction (can also be done sitting upright pressing against car seat headrest). With shoulders back and down, belly button drawn toward spine, and low back in neutral, push head back gently against pillow. Chin should remain in neutral; not tucked or lifted. Retract shoulders(maintain neutral pelvis) and slowly walk fingers toward toes. Hold 3-5 sec and make sure that you are not holding your breath. Repeat several times per day. 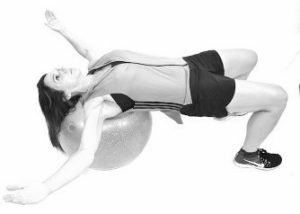 Shoulder scaption – sit up tall on exercise ball with thighs at 90 degrees and parallel to one another. Knees should be lined up over ankles and feet pointing straight forward. Arms begin at your sides with palms slightly tunred-up toward ceiling. 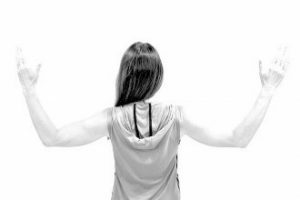 Retract your shoulder blades, draw belly button toward spine, slowly begin to raise arms up (shape of a “V”) until they are parallel with the floor. Hold for 3-5 seconds. Repeat up to 12 times (as your body tolerates). Perform this exercise 2-3 times a week with a day in between. Army crawl (do not use bands around arms if you are at risk for lymphedema). Stand about 12″ from wall with knees soft and feet pointing forward. Start with arms bent at about 90 degrees and forearms on wall (if you are using a band, you will be pulling outward (abduction) while you are climbing the wall. Without the band, you will do the same thing using an isometric contraction). Draw belly button towards spine and engage core as you begin to “army crawl” arms up the while while mainting abduction. Go until arms are fully extended And then slowly “crawl” back down to starting position. Repeat up to 8 times (as your body tolerates). 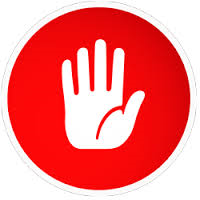 Start and progress slowly, particularly if at risk for lymphedema (too much too soon may trigger swelling). Perform this exercise 2-3 times a week with a day in between. These exercises should not be done without proper supervision and prescription by a Cancer Exercise Specialists or Physical Therapist. Timing and sequence of exercises depends on each individual and their recovery rate. At any point during your exercise session, if you experience swelling in affected area or unusual pain or discomfort, stop exercising or modify your position. If it continues consult your doctor before resuming your exercise program. *Remember that the latissimus, if fired, will contract under the breast where it is now located. Avoid lat pull-downs and rows and focus on exercises that encourage scapular stability.